Several businesses were honored on Monday by the Delaware Area Chamber of Commerce. Pictured, left to right, Small Business of the Year — Meade and Associates: Sean Meade, Tony Martini, Rod Meade and Patrick Werther; Citizen of the Year: Joe Pemberton, Suburban Natural Gas; Quality of Life Award — The Strand Theatre: Tracy Peyton; (back) Brian Meade; Corporate Citizen of the Year — Middlefield Bank: Chuck Moore; (back) Innovation in Business — Aler Stallings: Brenon Russell; Wayne Hilborn Lifetime Achievement Award: Jack Hilborn; and Large Business of the Year — Custom Air: Pat Halaiko; Aler Stallings Amy Himmelrick and Broc Sutek. Not pictured: Outstanding Chamber Member of the Year — Willow Brook Christian Communities. 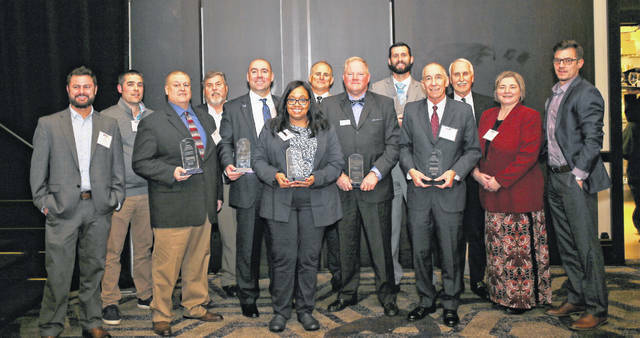 During the Delaware Area Chamber of Commerce’s annual dinner and awards ceremony held Monday at the Hilton Columbus/Polaris, six area businesses were recognized for not only their involvement with the chamber, but also their impact on the community as a whole. The Small Business of the Year award was given to Meade & Associates, an accounts receivable management services company located at 737 Enterprise Drive in Lewis Center. The award is presented annually to a Chamber member business which has been in operation for at least five years and has fewer than 50 full-time equivalent employees. The company must also demonstrate an exceptional contribution to the community and/or its industry, while also having a reputation for integrity and fair business practice. The Large Business of the Year award, which is awarded yearly using the same criteria as the small business award except the business must employ 50 or more full-time equivalent employees, was presented to Custom Air – Delaware Heating & Cooling, 2097 London Road, Delaware. The Quality of Life Award, which recognizes nonprofit Chamber member organizations whose work enriches the lives of Delaware County residents, was presented to the Strand Theatre, 28 E. Winter St., Delaware. To recognize Chamber member businesses that have used innovation to stand apart from its peers in product development, customer service and/or employee relations practices, the Chamber created the Innovation in Business award. On Monday, the award was presented to AlerStallings. A legal firm specializing in estate planning and elder law, AlerStallings has 11 locations throughout Ohio, including one in Delaware at 15a N. Franklin St. The Corporate Citizen of the Year award — given yearly to a Chamber member business that maintains a holistic culture of giving that consistently encourages its staff to impact the community by sharing time, talent, and treasure above and beyond the organization’s capacity in relation to its resources — was presented to The Middlefield Banking Company. The full-service commercial banking company operates 12 locations in northeast Ohio and four locations in central Ohio, which includes Powell and Sunbury branches. To recognize the Chamber member business that makes extraordinary use of its membership, the Outstanding Chamber Member of the Year award is handed out each year. Taking home the award on Monday was Willow Brook Christian Communities, which provides Christ-centered senior care at its three central Ohio locations. In Delaware County, those locations include Willow Brook Christian Village, 100 Willow Brook Way S. in Delaware, and Willow Brook at Delaware Run, 100 Delaware Crossing W. in Delaware.